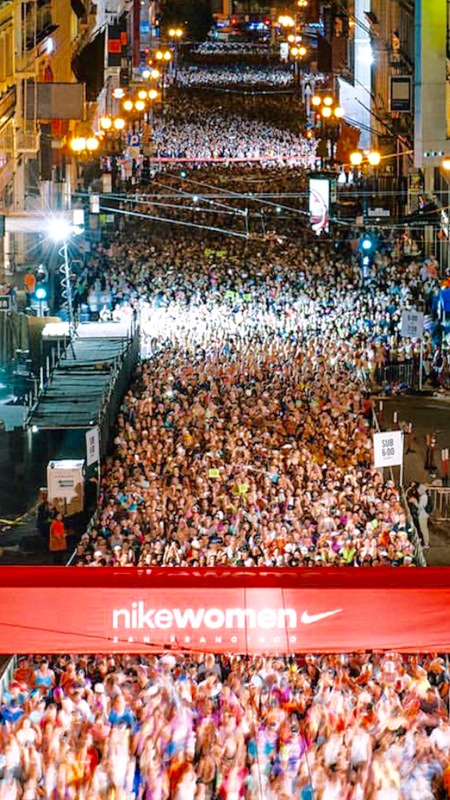 If you have ever thought about running a half marathon, I would definitely recommend running the Nike Women’s half marathon! 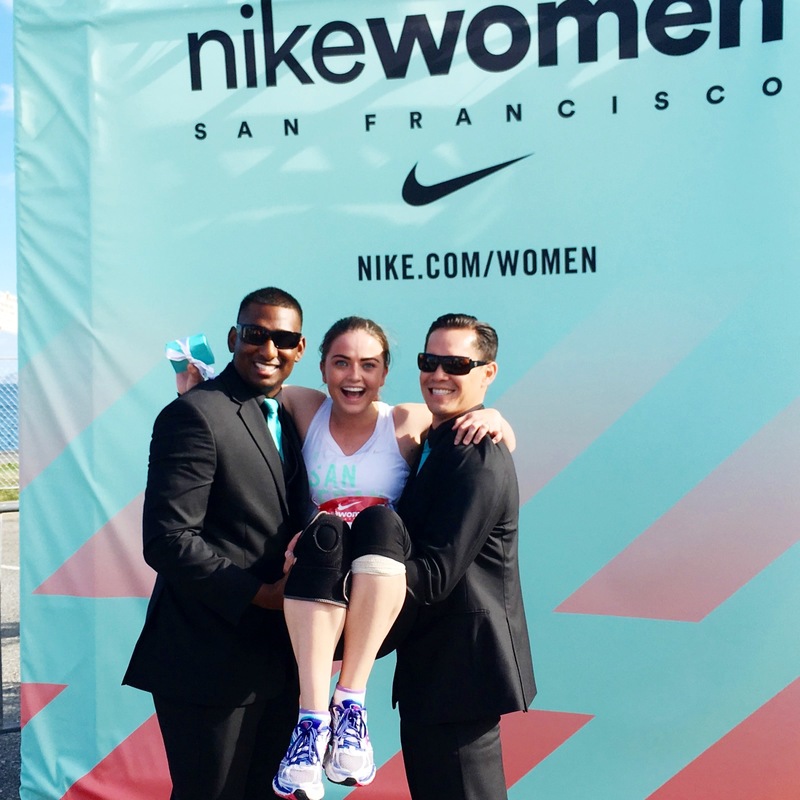 I have never been much of a runner, but my friend Brittany asked if I wanted to be a part of her team and run in this race. I decided to do it even though I had never run more than 4-5 miles. I signed up in July a few days before registration closed but knew I had time to train, because the race was not until October! It is a lottery so you don’t know if you made it in until a couple weeks later. I finally got an email that said “Congratulations You’re in!” ….. and I was terrified! Well time went by and I had only trained a few times here and there. 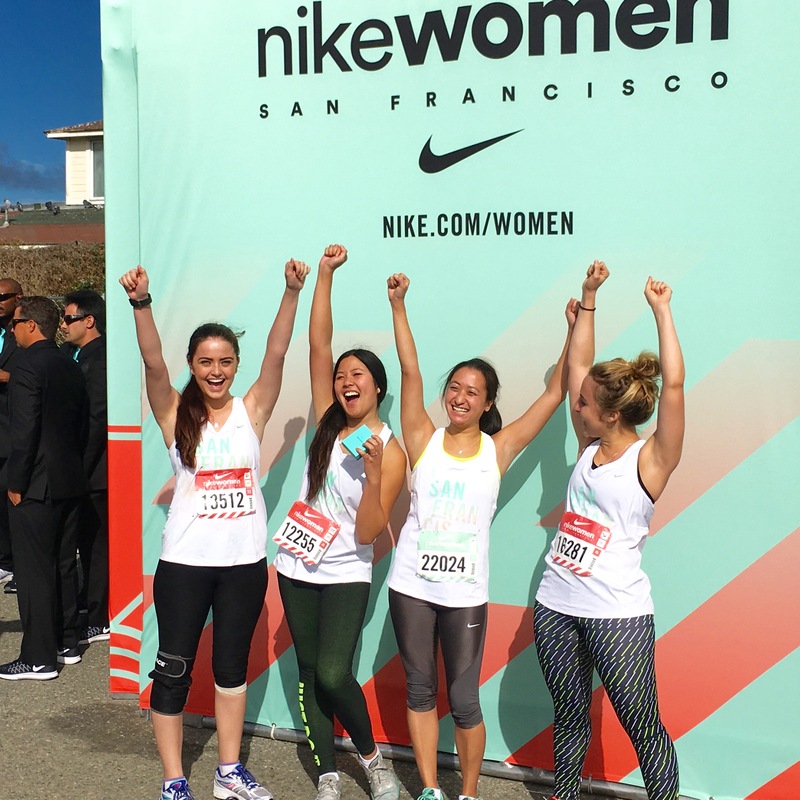 I suddenly realized the race was only weeks away… so I started running when I could and I did Yoga often. I was so scared I tried to find every excuse I could to not do it. However, I had already paid so there was no getting out of it. My husband encouraged me and kept telling me to think positive and that I could do it! When the week of the race arrived I started researching what to eat, drink, and do before the race. The number one thing I kept seeing was to drinks LOTS of water! So the Monday before my race I started to drink as much as I could, whenever I could. I also started to use a foam roller everyday to loosen my muscles and I tried to stretch. There was an early packet pick up, which I took advantage of . I picked up my bib and gear bag. I would suggest trying to go to an early pick up, to avoid the horrendous lines you would otherwise run into! I was able to get my Nike shirt personalized with my name for FREE. The Saturday before my race I went and had a carb-loaded pasta dinner. It is very important to carb load up to two days before your race so that your body can turn those carbs into energy— which you will need! I drank a ton of water before going to sleep as early as I could. Making sure you get to bed early will also be crucial. Before getting in bed I made sure I had everything I needed, from my bib to the pair of socks I was going to wear. I was super nervous/excited so it was pretty hard to fall asleep. I told Michael (my husband) that I felt like Santa was coming in the morning! I had to wake up at 4:15 AM to get everything ready and eat my pre-race breakfast, which was half of a bagel and a banana. I drank about 16oz of water right when I woke up and a few sips before I started my race. We had to drive up to San Francisco, which took about an hour, so it gave me some time to wake up and mentally prepare! When we arrived, we found parking only a few blocks away from the starting line. Michael brought his bike, so that he could ride along the route and meet me throughout the race. He walked me to my wave/corral and wished me luck! I was in the 10-10:59 wave so I would not start running until about 30 minutes after the gun time. When it was finally my corral’s turn, my heart was beating so fast and my adrenaline was pumping. As I passed the starting line my official time said I started at 6:56:35. 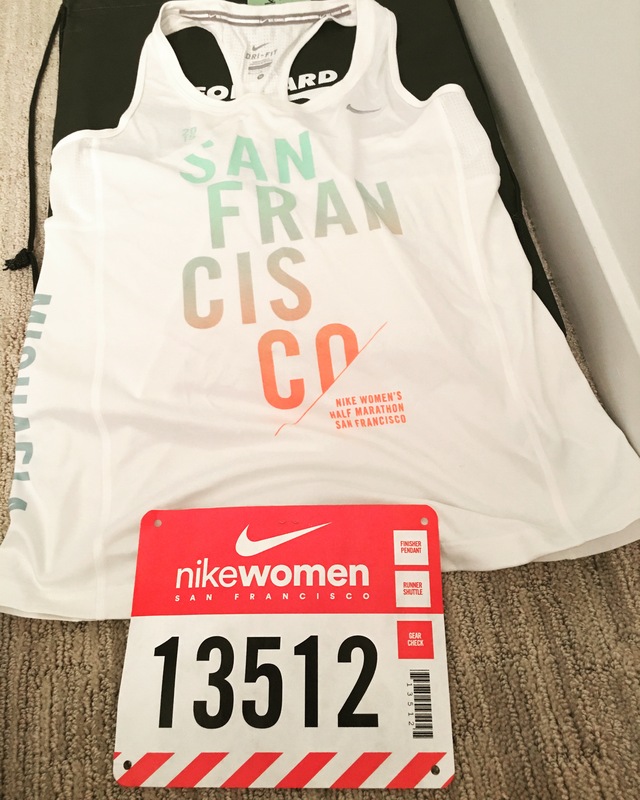 Nike put a tracker on each bib so that if your friends or family wanted to track your number they could. I had my parents, husband, and a few friends tracking my run. It made it much more exciting knowing, I had them cheering me on every mile and knowing where I was at! There was also a satellite option that allowed them to see my surroundings as I passed them. The first few miles I just focused on moving at a steady pace and preserving as much of my energy and strength as possible. Throughout the race there were multiple water/bathroom stations. I took advantage of every stop that I could but made sure not to spend too much time there. I hit the 5k mark at about 37 minutes and 10k at 1:15 minutes. My legs started to go numb at this point and it all started to became a mental battle. I had to keep reminding myself why I was doing this and that I could do this! STAY POSITIVE! I made sure not to compare myself to the women surrounding me who probably trained much more than I did. Every time I came to a water station I made sure I took a drink of water as well as Nuun (an electrolyte drink that Nike volunteers and supporters were passing out). It can’t stress enough how important it is to stay hydrated throughout the race; your body loses so much water and nutrients that you need to keep renewing them when you can! When I reached Mile 7 I finally saw my husband, and I was sooo happy! I think it is really great to have someone at the race supporting you and cheering you on. All of the supporters were great, but seeing someone you know is that much more motivating. He told me I was doing awesome and to keep going! Every mile that you pass in the race there are some group of supporters – anywhere from bands, dancers, and choirs to cheerleaders. I was so excited every time I saw a mile marker and it was always fun to guess what would be waiting for us; I couldn’t believe that my body had made it that far. I was so proud of myself for persevering! 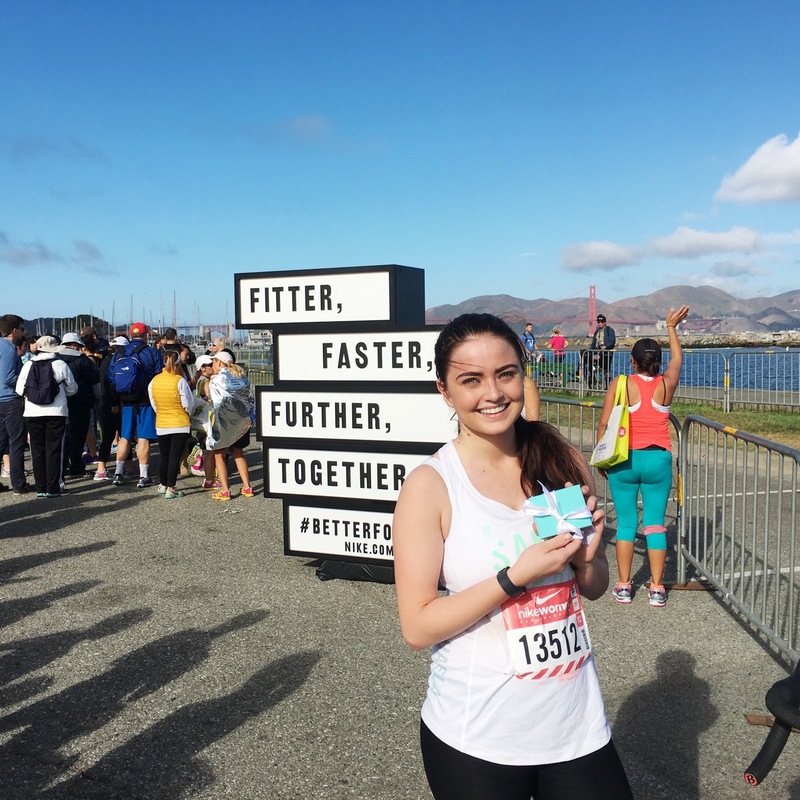 On mile 11, we ran by and they even handed out a much needed treat – a piece of Ghirardelli chocolate! Talk about being pampered!! As you can see the look on my face (pictured above), I don’t think I have ever been more excited for a delicious piece of chocolate! Everyone had the biggest smile on their face and kept thanking the volunteers as they got their piece. At this point there were only two miles left!! Those last two miles were killer…… I started thinking “Tiffanys necklace… you’re mine…. You can do this!” I mean, the necklace was one of the main reasons I wanted to run this race in the first place! Not to mention the cute firefighters in tuxedos that you take pictures with at the end! While I was running my last mile, there were thousands of people lined up with signs of encouragement screaming and cheering everyone on. I knew my cute husband would be waiting for me and so proud at the finish line. When I finally saw the finish line, I gave it my all and I finally crossed the finish line at about 2 hours and 41 minutes. I have never felt so accomplished in my life….. 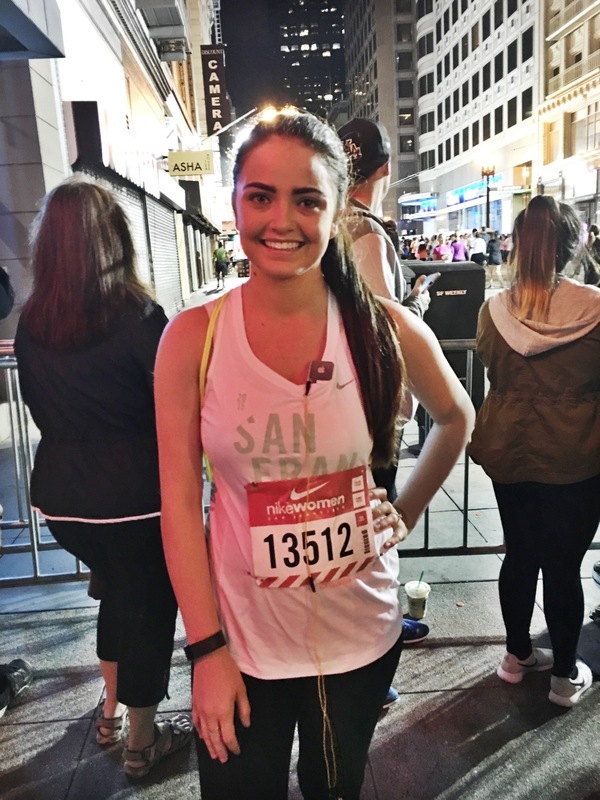 I actually finished a half marathon! I had never run that far before. I was so happy that I was practically in tears. I started looking for my husband, but couldn’t find him anywhere because the crowd was so big and we didn’t have a meeting plan, which would have been the smart thing to do. 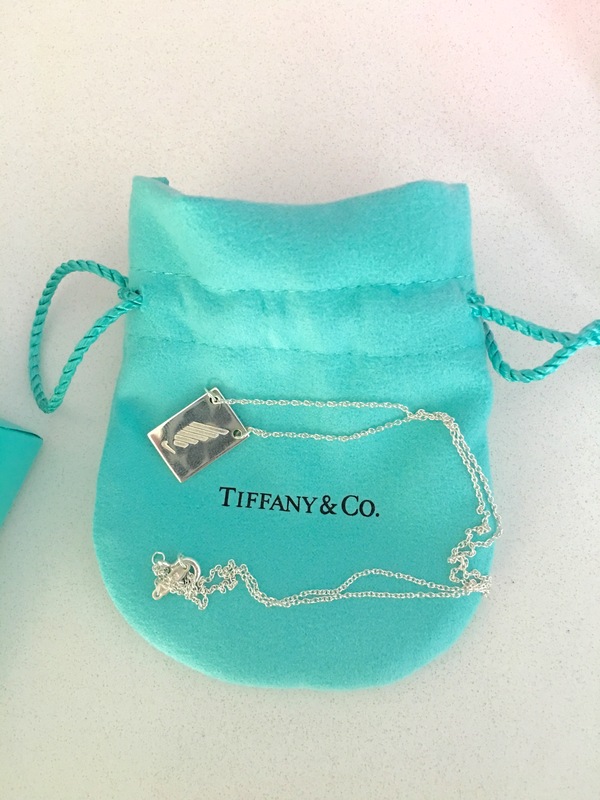 I finally got what I had been waiting for… I got my Tiffany’s necklace! After I finally found my husband, I also got my picture taken with the firefighters! After 13.1 looong miles, I had made it and my dream had come true! I learned a lot about myself during that race. There were times I wanted to give up, quit, and cry, but I pushed forward. I learned that I could do anything that I put my mind to and that I am a lot stronger than I ever thought I was. 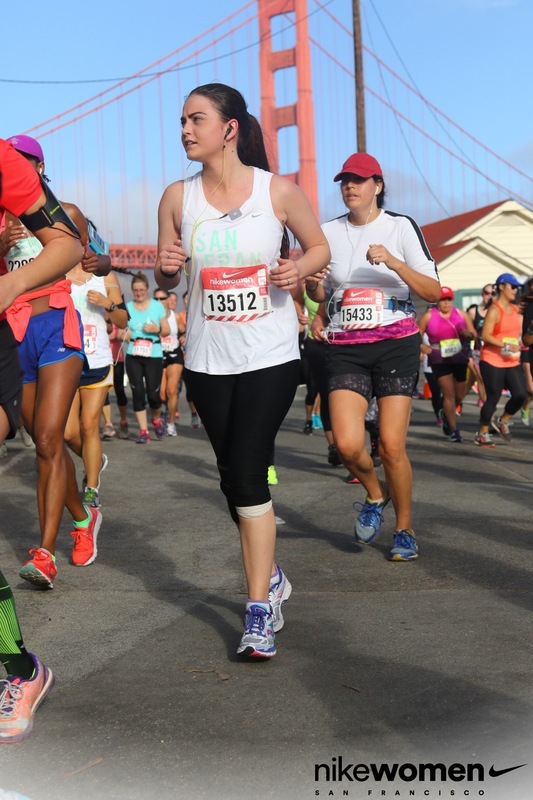 I also learned the importance of preparation; I would strongly recommend training for at least 12 weeks before doing a half marathon, as my body is now in more pain than I’ve ever been! This year, my goal was to make it to end and to get the necklace. Next year, my goal will be to beat my time and to be able to actually run up the hills. 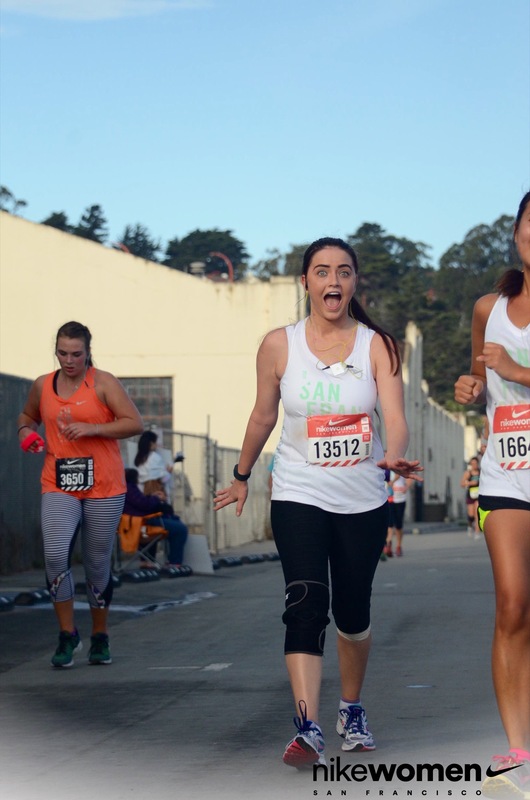 If you have any specific questions about this half marathon, if you’re an avid runner or if you’re looking to run a marathon sometime soon, please comment and visit my blog!!! I would love to hear your thoughts – I already can’t wait for next year! !